Do you like your pepper jack cheese to have an extra kick? What about your yogurt? Is it creamy enough for you? Do you want your dairy company to hear what you have to say about its products and—this is the crazy part—take action? If you live on the West Coast, you may be in luck. Tillamook, the 106-year-old farmer-owned dairy co-operative has just launched a consumer co-op with that goal in mind. The new initiative, created by 72andSunny in Los Angeles, deepens Tillamook's relationship with its customers. Those who join—at no charge—can attend board meetings, submit ideas, vote on new products and go to exclusive foodie events. Beyond that, new co-op members are given a micro-loan of $5 through a program powered by KivaZip. In turn, members give that to independent entrepreneurs focused on sustainable farming. The move is part of Tillamook's effort to expand the brand from its Pacific Northwest roots to the greater West Coast, including California. "We're the perfect brand for people that are concerned and want to know what they're eating," said John Russell, director of marketing for Tillamook. "We've always been a pretty transparent company and very farm-to-consumer, so why not give consumers more of a voice in what we do? We're going to continue to grow and come out with new products and continue to look at how to make our products better, so why not invite consumers into the conversation?" It's clear that consumers are intrigued by the concept—nearly 16,000 people signed up for the co-op within 24-hours of its launch, according to 72andSunny. "This goes beyond a traditional ad campaign," said Jim Moriarty, director of brand citizenship for 72andSunny. "We've taken the co-op that has existed with the farmers for 100 years and extended that out to consumers. 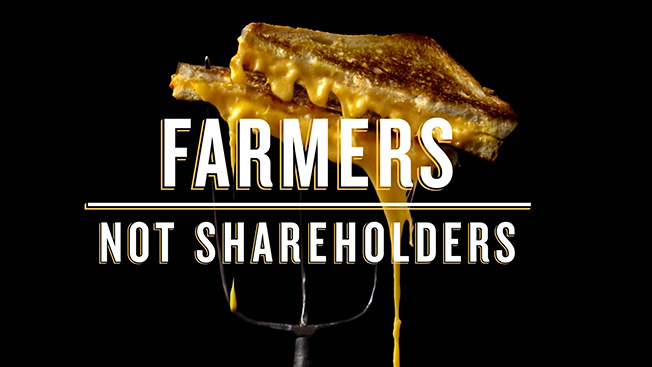 "Tillamook goes deeper on the idea of this real food movement and takes a leadership role on the dairy side of that. There's been a lot of talk in real food in different categories, but there hasn't been a leadership voice in the dairy category." The agency, which won Tillamook's business last fall, has also created a new campaign for the brand with the tagline "Dairy Done Right." The spots emphasize how the company's structure—it has been run by a co-op of farmers since its inception in 1909—allows it to focus on its product quality over its profit margin, creating products the "right" way, according to Russell. "We know that our competition [can't be transparent] like we can," said Russell. "If we had something to hide it wouldn't be the smartest thing in the world to do but we don't. We want to be transparent and we think people want more transparent brands. "